Does it Snow on the Amalfi Coast? Have You Ever Wondered if it Snows on the Amalfi Coast? When you imagine the Amalfi Coast, what does it look like? Do you see rugged beaches bathed in warm summer sunshine, colorful beach umbrellas fluttering in the breeze and the sparkling sea? Or perhaps a bougainvillea draped terrace or trees dripping with lemons. Well that is absolutely what it is like on the Amalfi Coast … most of the year! But what about the winter? Does it ever snow on the Amalfi Coast? Many of you have asked that question over this past month, as I’ve shared several videos and photos of blustery weather and snow on the Amalfi Coast over on the Ciao Amalfi Facebook page. The answer is yes it absolutely does snow on the Amalfi Coast! However, it is a rare occurrence, and usually only happens about once every winter. This January has been an exception. We’ve had several snowy days that have caused a bit of havoc in the higher towns on the coastline like Agerola, Furore and Tramonti. When Does it Snow on the Amalfi Coast? A cold snap usually arrives in December, just in time for the holidays. Three years ago there was an incredible snowfall on New Year’s Eve day that even reached the beaches on the Amalfi Coast! You can see more photos of this beautiful snowfall (including our fluffy orange cat Puffy playing in the snow!) in this blog post. If it is going to snow, it generally happens between December and January. By February the temperature is already starting to rise and the days become noticeably longer. 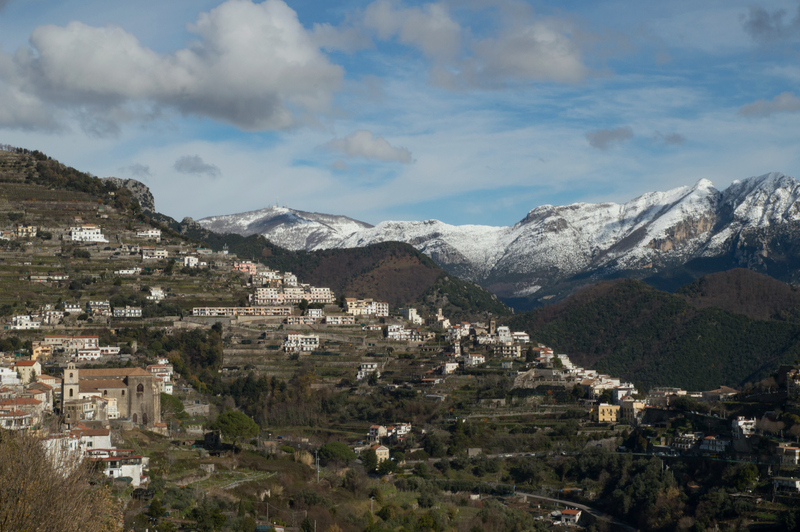 Where Does it Snow on the Amalfi Coast? Except for rare occurrences like that New Year’s Even snowstorm, snow usually only falls on the higher elevations of the Amalfi Coast. It’s not uncommon to see the mountaintops dusted with snow like the photos I’m sharing in this post. 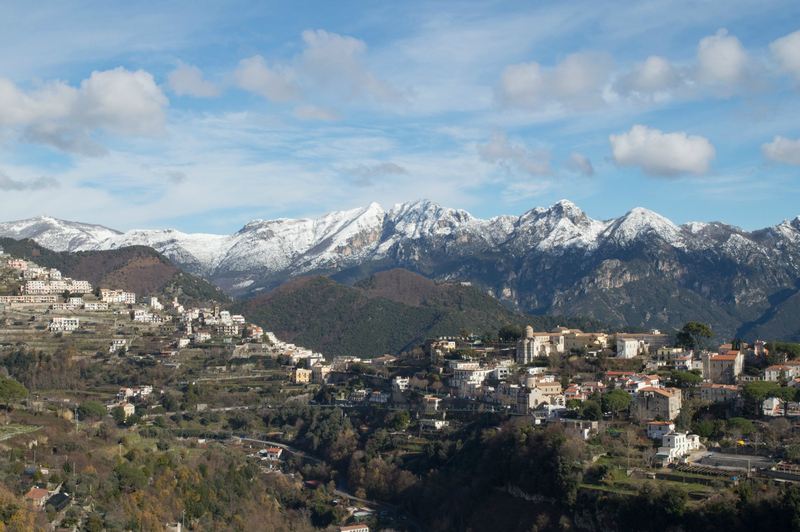 Towns like Scala, Ravello and Tramonti are more likely to get snow than sea level towns like Amalfi or Minori. Positano has such a massive elevation change from the beach to way high in the mountains of Montepertuso that sometimes it can indeed snow in Positano. Just at the higher elevation frazioni of Montepertuso and Nocelle. Since it happens so rarely, it’s a nice surprise to wake up and find snow-capped mountains or a dusting of snow on the ground. 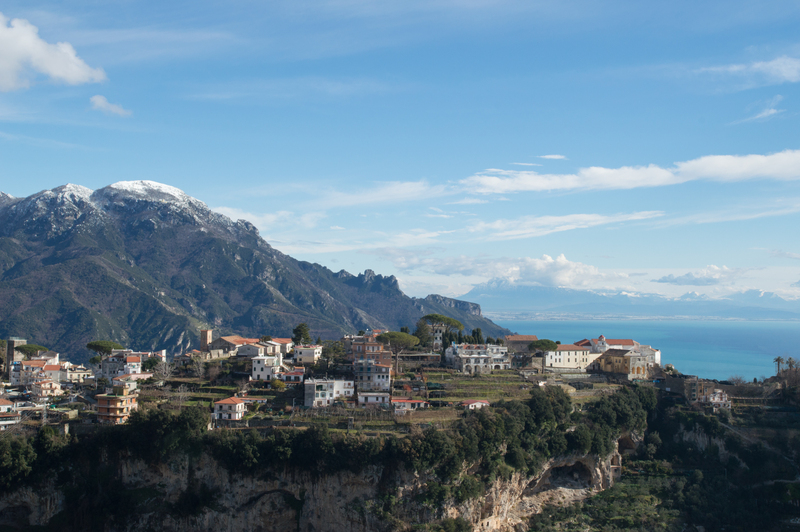 Have you seen snow on the Amalfi Coast? 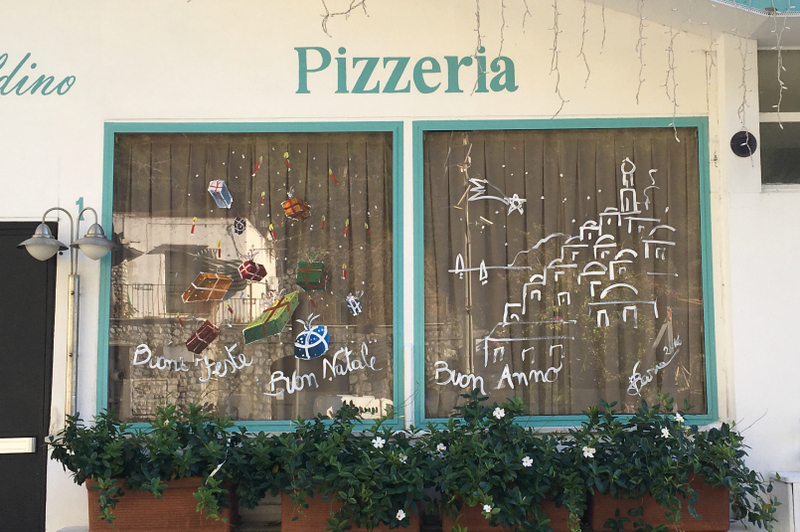 Share your photos over at the Ciao Amalfi Facebook page! 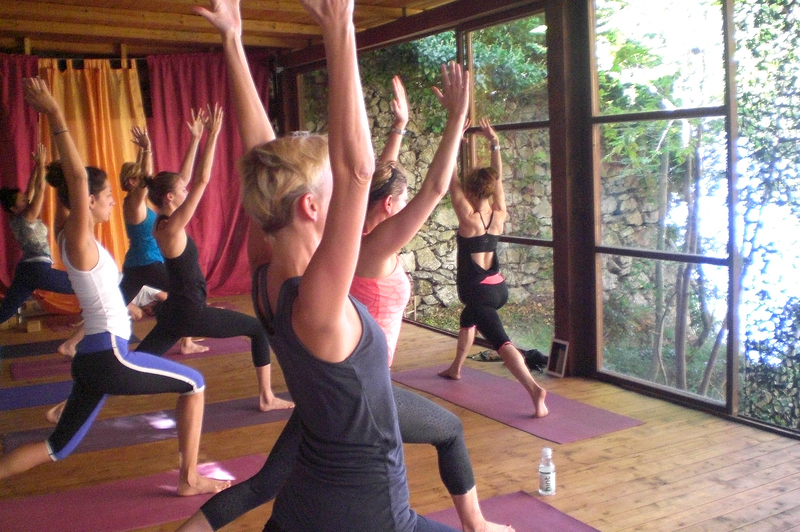 Get Your Move On in Positano with a Yoga Retreat! Snap snap … come back mind! Last year I shared about my time at this incredible Amalfi Coast Yoga Retreat in Paradise, and it was absolutely one of my top experiences of 2016 and one of my favorite in my 10 years living on the Amalfi Coast. 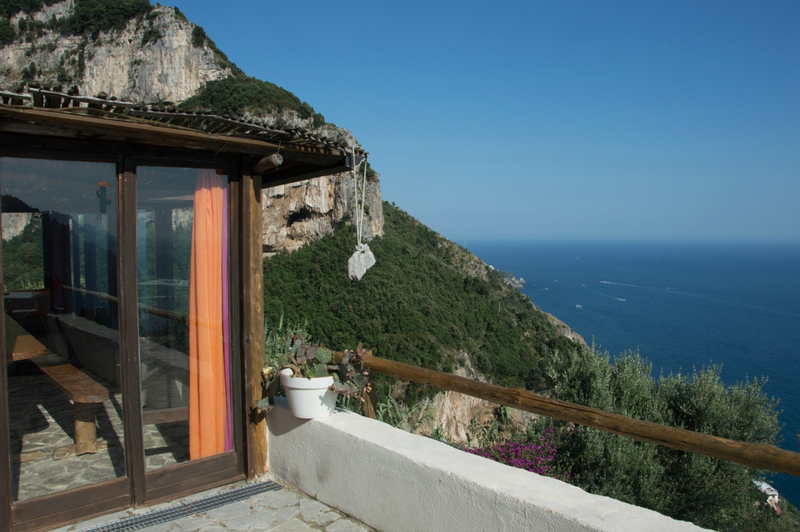 This retreat has been lovingly created by yoga teacher and Amalfi Coast enthusiast Shari Hochberg, who owns Sole Yoga Holidays. Shari adores Positano and this shines through in her entire retreat, which is situated in the rustic eco-resort La Selva that is set in the mountains above town surrounded by peaceful terraced gardens. If you want to get away from it all while still being a short hike from Positano – this is your heaven! 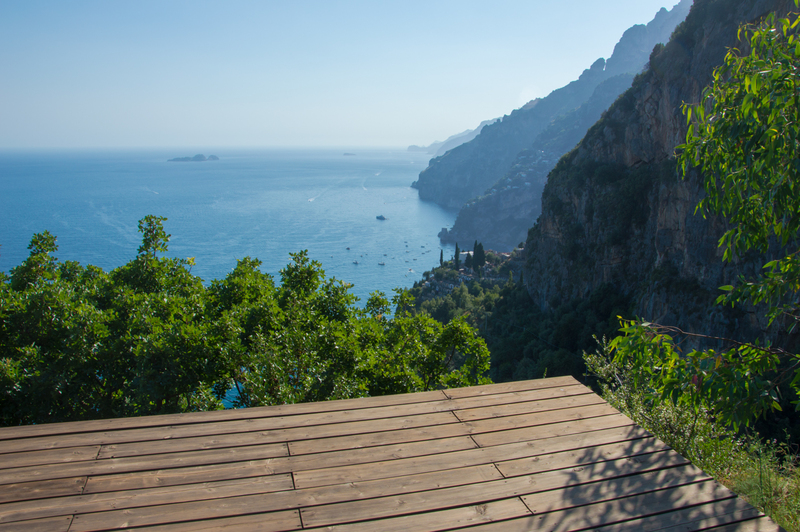 Imagine joining a group of fun-loving yogis for daily Ashtanga flow yoga on that outdoor platform or in a beautiful room surrounded by nature, all with the Amalfi Coast as the backdrop. Then there’s the beautiful organic meals prepared from locally grown products. We couldn’t wait to see what was on the menu each day! Everything was so fresh and rejuvinating – full of the Amalfi Coast sunshine. For the group, Shari also organizes a boat trip around Capri, a relaxing day at the beach in Positano and includes extras like handmade sandals in Positano. At La Selva and in the mountains surrounding the eco-resort there are also options for hiking and rock climbing for the more adventurous. The peaceful setting above Positano is absolutely idyllic – perfect for a yoga retreat to recharge and reinvigorate the soul while surrounded by the beauty of the Amalfi Coast! After the fun I had last year joining the retreat for a couple of days (which weren’t enough! ), I knew I had to share more about this unique experience that Shari has created. 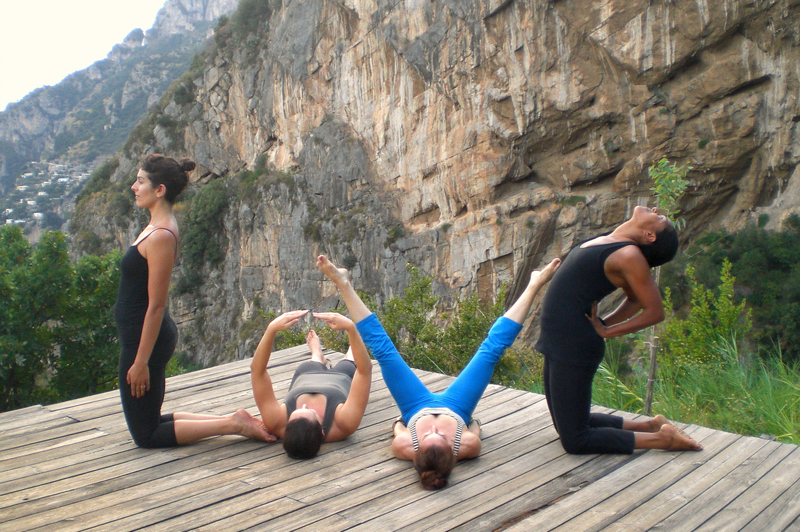 Because I know that if you love the Amalfi Coast and love yoga – this is something you won’t want to miss! This was the inspiration behind my new Amalfi Coast Experiences page on Ciao Amalfi. This Positano Yoga Retreat is the first of many wonderful local experiences that I look forward to sharing with you this year! I couldn’t imagine a more stunning way to expand your yoga practice, get moving in 2017, make new friends, enjoy fabulous organic meals and, of course, those panoramic views of the Amalfi Coast. I hope I’ll see you in Positano this year for the Sole Yoga Holidays Positano Retreat! 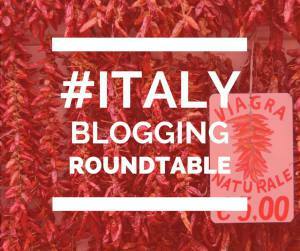 This blog post is part of a series called The Italy Blogging Roundtable. Every month our group of Italy based writers takes on a new theme, and you can read the contributions for this month’s topic – Move – at the links below. We’d love to hear your thoughts and comments. Please share the stores if you’ve enjoyed them! *Not to be used with any other offer or discount. Please review the Sole Yoga Holidays policy for information. Ask Me Your Amalfi Coast Travel Questions! Welcome to 2017! 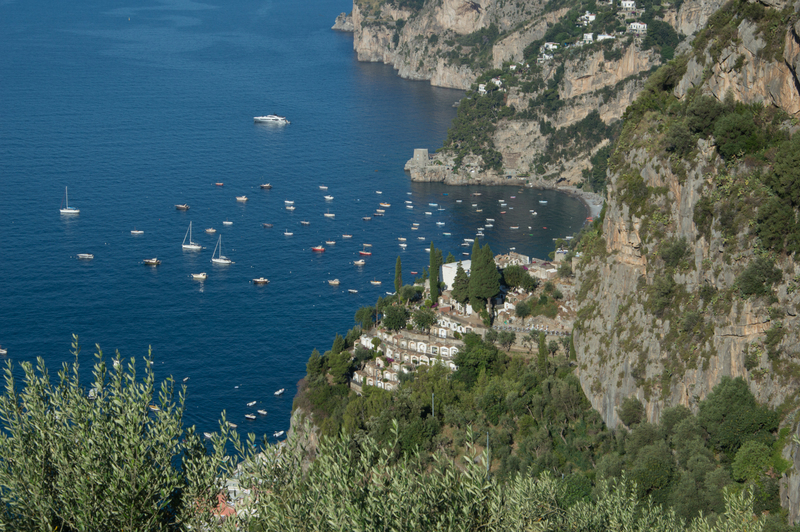 It’s a new year, and I hope one that brings you to the Amalfi Coast. I have a lot of exciting projects planned for 2017, but I would love to jump start the year by helping you out. 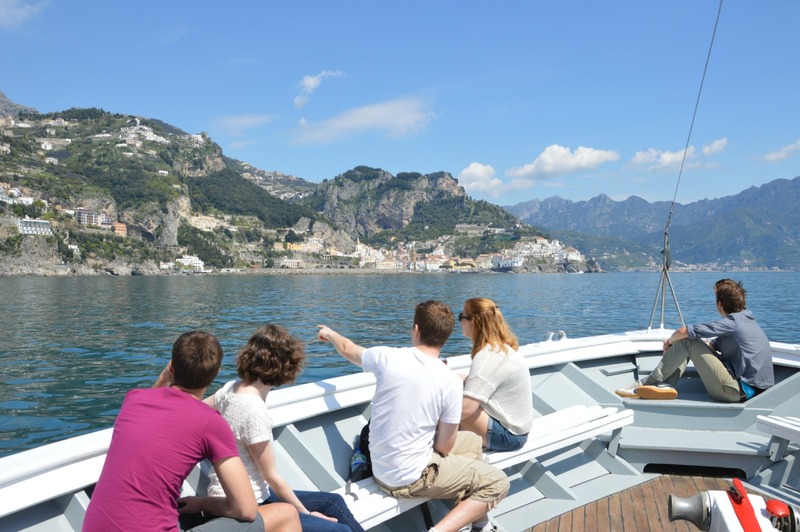 Are you planning a trip to the Amalfi Coast this year or one day soon? Curious about where to stay or how to get around? Thinking of a romantic getaway or family holiday? Maybe you’d like to know the best time of year for chilling at the beach or you have some burning questions about life on the Amalfi Coast. Well now is the perfect time to ask! 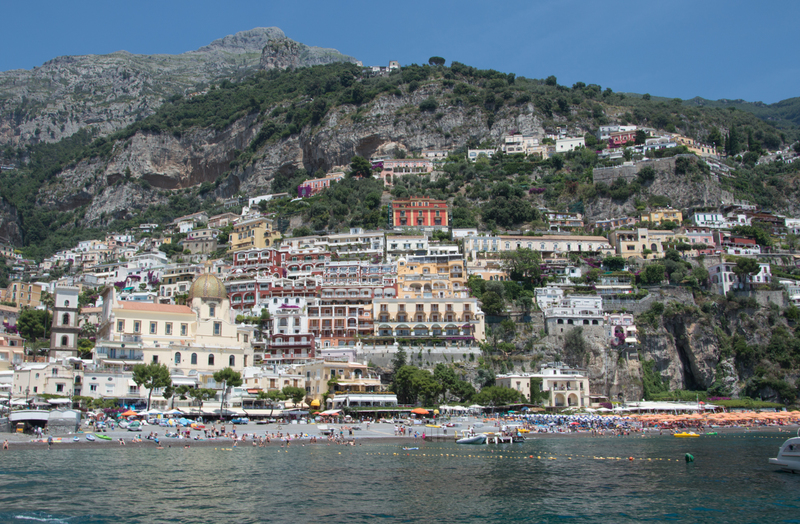 What questions do you have about the Amalfi Coast? Just leave me a comment below with your questions! I’ll answer as many as I can right away and use your questions to build custom features coming up soon on Ciao Amalfi that will help with your Amalfi Coast travel planning. I look forward to reading and answering your questions! Happy New Year from Amalfi! Happy New Year! I hope your holiday weekend was full of excitement and a good dose of relaxation, too. The new year always starts off with a bang in Amalfi thanks to the incredible fireworks display over the harbor. I thought you would all enjoy watching this beautiful video of the show this year by Amalfi based photographer Andrea Lucibello. It’s a bit slow to start, but it’s fun to watch the whole town light up in different colors when the big fireworks start going off. You won’t want want to miss the grand finale! My holiday weekend was spent close to home since one of our cats is very sick. But how many places in the world would you find a vet who would make a special visit to his studio on New Year’s Eve and also New Year’s Day? We’re grateful to know one such vet on the Amalfi Coast! Even though I’ve been home a lot, there was festivity in the air with church bells ringing, fireworks and, of course, the local Capodanno bands. (Capodanno means New Year’s.) These bands make A LOT of noise. So much noise that you can hear them from the next town over sometimes! These bands are a local tradition that spills over the mountains from Naples. They are a ton of fun to watch, especially when you take a close look at all the homemade instruments. In the video below of the Capodanno band in Amalfi, you can see all the instruments as they pass by. So much fun! Wishing you a fun start to 2017!